With Apple expected to take the wraps off its second-generation iPad in the next few months, talk has focused largely around the potential hardware enhancements to the tablet device, including rumors of an SD Card slot that AppleInsider sources now suggest is unlikely to materialize. That particular rumor appears to have gained its legs back in December when a pair of China-based case manufacturers leaked images of their upcoming iPad 2 protectors, which were presumably based off design schematics that often originate from Apple ahead of new product introductions and get passed around gray markets in the Far East. One of those cases was reportedly accompanied by documentation that 'suggested' one of its cutouts could provide access to an SD Card slot like those commonly found on today's MacBook Pros, while another was a circular opening for a rear camera that would accompany a front-mounted camera for Apple's FaceTime technology. The SD Card slot rumor gained a few more shots in the arm earlier this month through a handful of media reports and AppleInsider's discovery of yet another set of next-gen iPad cases, which suspiciously included a cutout for a slot on the upper left-hand side, opposite to where you'd find the volume and mute controls on the existing iPad. In a mockup analysis of all the openings and recesses in those cases, it was speculated that that left-side opening could represent the much-rumored SD Card slot. However, a person that AppleInsider trusts on matters such as these has since rebutted that notion, stating instead that the break in the next-gen iPad enclosure at that location is actually a relocation of the tablet's SIM card slot. (This could signal a smaller logic board in the next iPad and better battery life via and even larger battery). That may explain why some of the other next-gen iPad casings making the rounds don't sport the same opening, as users of 3G iPads aren't likely to need ready access to the SIM slot on a daily basis. And like Gruber's sources on the subject, the same person referenced above gave no indication that there's an SD Card slot elsewhere on the device. Still, that's not to say an SD Card slot hasn't been considered or won't surface in the future, as Apple is notorious for yanking features from its hardware designs in the final moments before the products hit the assembly lines. Sometimes they resurface in a latter revision, while others are forgone forever. For example, there were two core I/O features heavily rumored leading up to last year's launch of the current iPad which failed to materialize on the shipping product because they were axed by the Cupertino-based company right before the device went into production. The first, and most publicized, was a forward-facing camera. (There were also prototypes of a model featuring two cameras —one on the front, one on the back —like the iPad that's expected to debut this year, according to people familiar with the matter.) Evidence to this end quickly turned up in the first teardowns of the device last spring. "From our original teardown what we found most interesting was the ambient light sensor connector," Luke Soules, co-founder and teardown specialist at iFixit, told AppleInsider. "That connector has way more pins than you'd need for just an ambient light sensor and looks more similar to a typical camera connector." ] you can see unused solder points for a BGA [ball grid array] chip which could have been intended for a camera control chip," Soules added. "We think Apple was intending to put a camera in the original iPad, but for some reason changed their mind at the last minute." Meanwhile, another I/O feature once planned for the inaugural iPad and pulled at the last minute was a second Dock Connector that would have allowed the tablet to be used in landscape mode with accessories like Apple's iPad Dock with Keyboard, according to people familiar with the device's initial development. 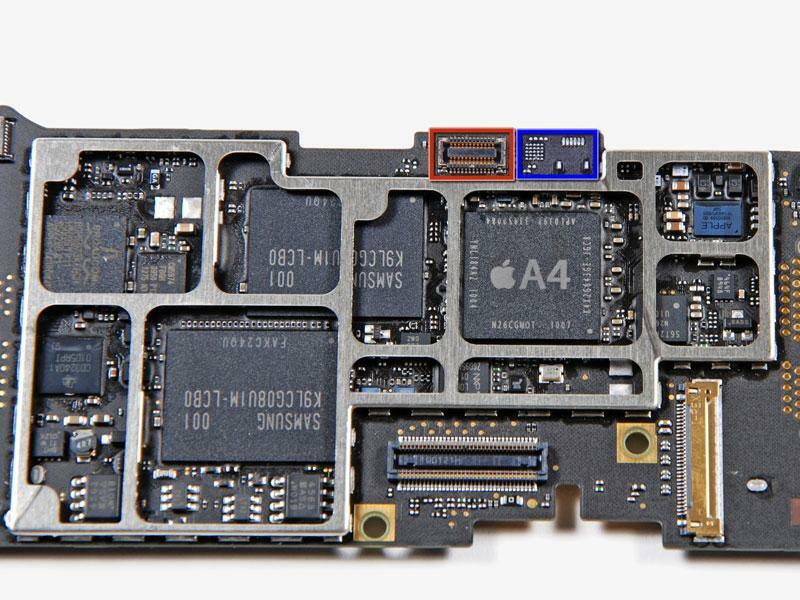 According to those same people, vague signs of that aborted implementation are also evident in early teardown photos of the iPad's logic board but hidden beneath a piece of black tape around the left-hand side of the device near the SIM connector flex, which is also said to sport a few too many pins to have been designed exclusively for a SIM . 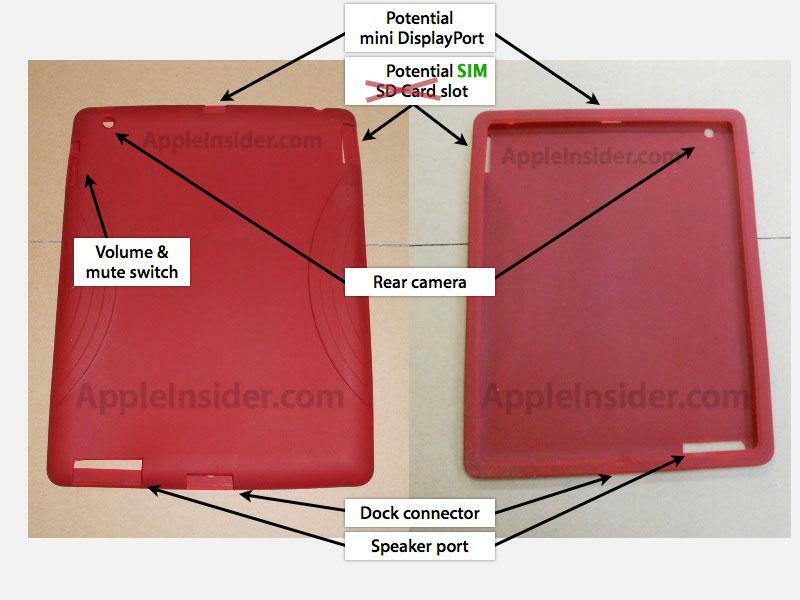 Indeed, photographs of a first-gen iPad enclosure showing both portrait and landscape Dock Connector ports would later surface but were misreported at the time by those who discovered them as potential enclosures for the second-generation iPad. It's unlikely that this proposed feature will ever see the light of day. When asked —given his insight into Apple's hardware designs and logistics —what he thinks of the rumors that Apple would be adding an SD Card slot to the iPad at this time, Soules said, "I don't see it happening." For more on Apple's second-generation iPad, see AppleInsider's iPad 2 information archive.